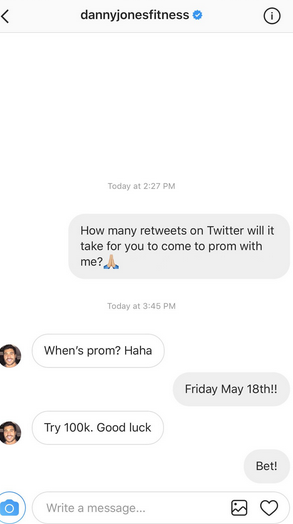 A teen asked an Instagram model to prom. He said yes—kind of—and then things spiraled. Being hot online can really open up the world. For example, take the existence of multitudes of fitness and Instagram models who get paid to promote products and post thirst traps. One such fellow, the fitness IG model Danny Jones truly encapsulates the meaning of thirst trap. Scrolling through his page will make you feel automatically creepy. But for the teen and Twitter user @grandeslices, Danny Jones' Instagram presence inspired her to get brave and make a move. With a bold slide into his DMs, she asked him just how many retweets she'd need to score a prom date. Much to her surprise and excitement, she got a response. Once she knew how many retweets she needed to secure the date, she brought her query to the magical world of Twitter. As you can see, the retweets came ROLLING IN. And with those retweets came plenty of commentary. When she inevitably got the required amount of retweets, S was reasonably excited. But sadly, the internet is still waiting on updates about the status of her Instagram famous prom date. Unsurprisingly, S has been receiving a LOT of feedback in her DMs. There have likely been a lot of prom offers rolling in. Naturally, I'll be keeping you all posted when she posts updates. Because naturally, a whole section of the internet is now invested in the status of her prom date.